7:00 pm Screening of the original Dawn of the DeadThe event will feature a costume contest with a prize for the Best Steelers Zombie, a zombie movie trivia contest, raffles, prizes and giveaways. Leonard Lies, who played the Machete Zombie in the original Dawn of the Dead, will be on hand to meet and greet fans. The theater will sell raffle tickets beginning on October 22 for a chance to win one of two Machete Zombie baskets donated by Lies containing a T-shirt, signed photo, Goblin CD soundtrack, comic book with Machete Zombie on the cover, a signed machete, and anything else his severed mind can think of. The drawings will take place following the movie on October 31. 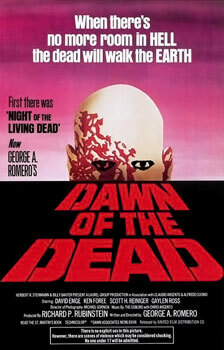 A rare public screening of the original 1978 Dawn of the Dead film will take place at 7 PM. Filmed in the Monroeville Mall outside Pittsburgh, Dawn is the second entry in the George Romero zombie film series. The film tells the story of a group of survivors of a plague outbreak who barricade themselves in a suburban shopping mall but are forced to fight zombies at every turn. Ticket prices are $6 for adults and $4 for children and seniors and can be purchased at the door. The film is rated R.
Following the Dawn of the Dead screening on Halloween night, the Hollywood will be showing Black Christmas at 9:30 PM and The Rocky Horror Picture Show at midnight. Tickets for all shows are sold separately. The Hollywood Theatre is located at 1449 Potomac Avenue in Dormont (15216). The theater reopened in August 2009 and is under new management by Motion Picture Heritage Corp., a nonprofit company based in Franklin, Indiana, that rehabilitates and operates classic cinemas nationwide in partnership with local communities. Opened in 1924, the historic Hollywood Theatre is the last surviving single-screen theater in the South Hills of Pittsburgh. The Hollywood is also a BYOB theater (beer & wine only). For more information on the Hollywood Theatre, please visit www.hollywooddormont.com or call (412) 344-1245. Pittsburgh’s modern horror convention, has teamed up with the Hollywood to occasionally present horror films and related events at the theater. The next convention date will be September 17-19, 2010 at the Crowne Plaza Pittsburgh South hotel. For more information on Horror Realm, please visit www.horrorrealmcon.com.